The reason why you may not see all the diary entries published online yet is that I am preparing for my RHS Level 3 exam next week, not that I am working or learning any less (or having less fun). 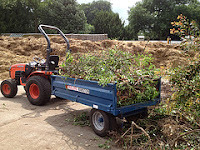 I am still clearing the middle bed of dead wood and overgrown plants, so that I can complete the stock-checking with some accuracy. 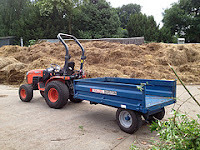 I am so engrossed by the task, and on such a tight schedule at the moment, that I forgot to take a "before" picture, but here is the panorama view of the "after": in front of the tractor is where I finished, behind the tractor, where I still have to work. 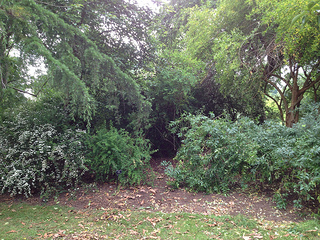 And, from the front of the bed, you can now make out the individual plants: two Spirea on the left, two Prinsepia on the right, and the Spirea in the centre at the back, instead of an undifferentiated mass of greenery. Going to and fro from the yard with my loaded tractor today, I thought it would be nice to talk about tipping the trailer, especially as several of my friends (girls in particular!) have been almost as excited as myself about my driving a tractor. 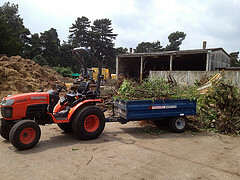 In the yard (where our compost heap is), we sort our loads in two groups: the green and the woody, which will be turned into soft and woody mulch respectively. Today I was tipping woody material. Before driving into the enclosed compost heap working area, you have to wear a hi-vis vest, so that any moving vehicle can see you. Of course, if there is any moving vehicles, especially the big tractors, or when our colleagues are working on shredding wood etc, you have to wait at the entrance until you are waved in, for safety reasons. 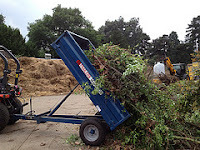 Once you drive in, you approach the relevant heap area and reverse your trailer as close as possible to it. 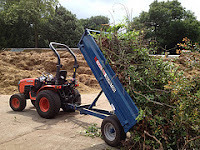 Then get off and a. open the back flap (when the load is not too high and likely to slide through it) b. remove the back flap, as I did, my load being quite big and full of branches that would get stuck. At that point, operating a lever will get the hydraulic hoist to lift the trailer, ready to dump. 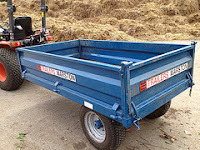 Once the trailer is up, driving backwards and forwards a little bit with great care (a lifted trailer is easily overturned, so you have to make sure the wheels are both safely level on the ground) will cause the load to slide off, in a neat, contained mound. Well, sometimes you have to help it along, as some branches might get stuck... they did today. What you should not do is just drive forward, as you would scatter the content all over the place. Then you lower the trailer, before replacing and fixing the flap, and driving off: mission accomplished!